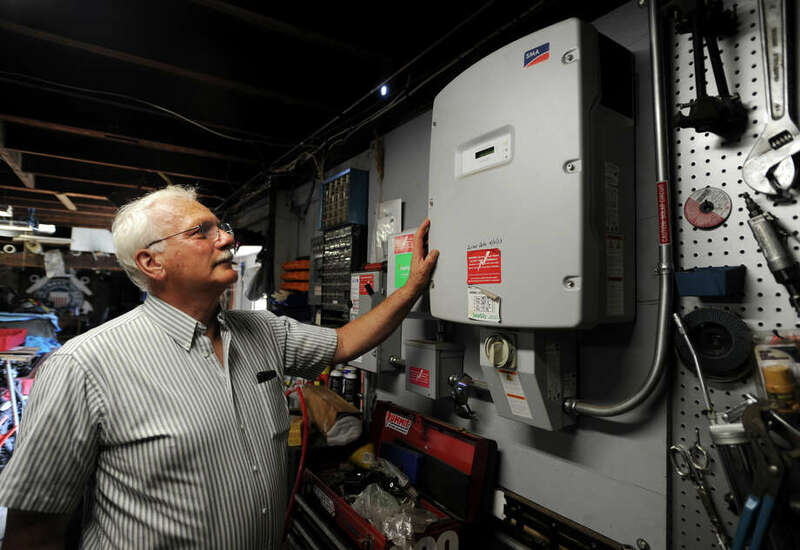 Pieter Moen, a member of Milford’s Energy Advisory Board, shows off his solar power inverter inside the garage of his home on High Street in Milford on Thursday. In Westport, it can take a day or less to process a residential solar permit, costing an average of $300. That same permit can cost more than $1,000 and take a month to process in Bridgeport. Those differences, identified in a recent study by Yale University, are among the many reasons why Westport was recently ranked seventh of the state’s 169 towns and cities for its support of residential solar adoption, engagement and permit processing. The town was the only Fairfield County municipality to make the top 10. Bridgeport, on the other hand, ranked last among the 169 municipalities in the state. Angel Hsu, director of Data-Driven Yale, which produced individual scorecards for each city or town in Connecticut, said although permitting was one of the major reasons Bridgeport came in last, it was not the only one. The largest city in the state ranked low in all categories — solar adoption, clean energy engagement, information availability, permit process and permit time and cost. The scorecards only looked at residential solar installations, not commercial or municipal plans. Hsu, an assistant professor at Yale-NUS College and adjunct at the Yale School of Forestry and Environmental Studies, said a town could rank low in one category, but still place well on the overall list, as long as it ranked well in other areas. For example, Coventry, the overall top performer, ranked 126th in permitting, the lowest ranking among the top 10. “Permitting is all over the place for the top performers. It’s not necessarily a determinant of high performance,” Hsu said, noting this means the scores indicated improvement was needed in that area across the board. No town or city received a perfect 100 score. Coventry’s 83.24 score was the highest in the state. Bridgeport officials said the results do not seem to take into account the city’s nearly 40 solar applications per month for the first five months of 2016. He said the city has seen so much demand for solar, as well as other development activity, that it recently added employees in the building department. This comes at a time when it is downsizing its overall workforce due to budget issues. Harris disputed the average permit fee. “Bridgeport’s typical permit fee cost for residential installations is far below the $1,100 mentioned,” he said. It wasn’t just major cities, like Stamford and Bridgeport, that ranked low on the scorecards, as more affluent towns also ranked poorly. Greenwich came in at 158th and New Canaan took the 160th spot. “It just seems like they’re not engaged as much as other towns,” Hsu said. But Greenwich Conservation Director Denise Savageau said she thought the scorecard was flawed. “It’s not that there’s never room for improvement, but it really doesn’t tell the whole story,” she said. She said the cost of living and doing business in Fairfield County is higher than other parts of the state, so to rank municipalities in part because of the cost of a permit doesn’t seem to take that fact into account. In places like Greenwich, she said, solar installations are often completed as part of a larger home renovation, which could impact the processing time for a permit. Hsu said the researchers were open to towns’ input on the scorecards. “This is the first effort, so there are bound to be issues,” she said. But she noted areas outside of the permitting process — like engagement, information and adoption — were key areas that all top 10 performers scored well on. Engaging people and informing them of the benefits of solar is something Milford officials focus their efforts on each year, said Julie Nash, economic development director for the city. It ranked 16th in the state. Alan Brewster, chairman of the advisory board, said people in Milford have been aware of the benefits of going solar for years — well before the town launched its Solarize Milford campaign, a Connecticut Green Bank initiative that other municipalities have launched in recent years. Brewster said close to 150 homes had solar panels before the program went into effect nearly two years ago. Another 60 houses were added to that number during the program. One of the homeowners who had already installed solar panels on his property was fellow advisory board member Pieter Moen. He said he learned about the benefits of solar on his own, and has significantly reduced his energy bill and stabilized those costs by locking in a rate for the next two decades. Since then, he said the city has become more active in promoting the benefits. “I think the atmosphere is there to promote solar,” Moen said. In Norwalk, which ranked 129th, officials are hopeful their efforts to promote solar will garner them a better score in future research. John Kydes, chairman of the Mayor’s Energy and Environment Task Force, said its Norwalk Solar Challenge, launched last month, has piqued the interest of 30 homeowners and 20 commercial property owners. “We’re expecting the numbers to improve dramatically for next year,” he said. Hsu said the scorecards were produced to help the Connecticut Green Bank find areas where municipalities could use assistance, and to pinpoint which towns were doing the best and why. She said it has been surprising to see the strong reactions from municipalities that didn’t do well or ranked poorly. The researchers, she added, have been open to suggestions and wouldn’t rule out a new round of rankings in the future. To check out your town’s score, visit ctsolarscoreboard.com.